New Zealand dairy giant Fonterra Monday apologized for the milk powder contamination scare in China, one of its largest markets, and pledged that all the contaminated material would be brought under control within 48 hours. 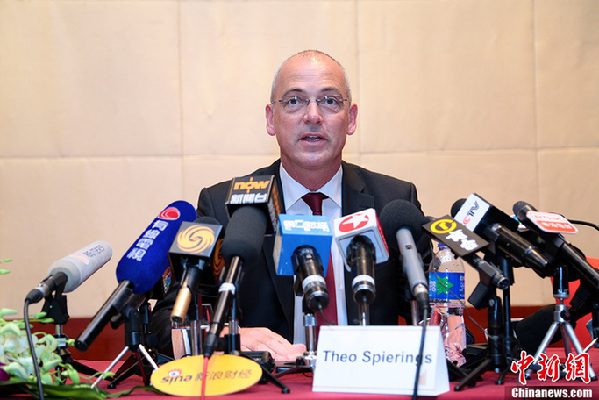 Fonterra's chief executive Theo Spierings made the apologize at a media briefing in Beijing after hurriedly flied in to deal with the crisis. "We really regret the distress and anxiety which this issue could have caused," he said. "We totally understand there is concern by parents and other consumers around the world. Parents have the right to know that infant nutrition and other dairy products are harmless and safe." Fonterra announced over the weekend that it had found a type of bacteria that could cause botulism. It said contaminated whey protein concentrate had been exported to China, Malaysia, Vietnam, Thailand and Saudi Arabia and used in products including infant milk powder and sports drinks. The New Zealand authorities immediately launched a global recall of up to 1,000 tons of dairy products across these countries. According to Spierings, Fonterra was not facing a ban on its products in China, only restrictions on whey protein concentrate. He said that 38 metric tons of whey protein concentrate were contaminated, of which 18 metric tons were used in its own factories in Australia and New Zealand to produce milk formula for two customers. China's consumer quality watchdog has named four Chinese producers that had imported allegedly tainted dairy products from New Zealand, including China's largest beverage producer Hangzhou Wahaha's Health Food Co and its Import and Export Co, as well as infant nutrition company Dumex, and State-owned food producer Shanghai Sugar Cigarette and Wine (Group) Co. All four companies have initiated recalling measures. On Monday the quality watchdog issued another warning over two potentially tainted New Zealand-made Karicare-brand infant formula products because of botulism concerns. The General Administration of Quality Supervision, Inspection and Quarantine (AQSIQ) issued a consumer alert after receiving a warning notice from the New Zealand Embassy in China at midnight Sunday. In the notice, New Zealand's Minister for Primary Industries advised consumers to suspend the consumption of the two potentially contaminated products. However, the minister did not say whether or not they will recall them. The products are Karicare stages 1 and 2 infant formula. AQSIQ said it has urged the New Zealand government to check and provide detailed information of potentially tainted products. It issued a similar warning for three batches of Karicare-brand dairy products and announced a list of four companies that have imported potentially contaminated products from New Zealand dairy company Fonterra on Aug. 4. Shanghai-based Dumex Baby Food Co., Ltd., one of the four Chinese companies on the list, has sealed up potentially tainted dairy raw materials and products and initiated preemptive recalls on Aug. 4, according to Shanghai quality authorities. This is the second contamination issue involving Fonterra this year. In January, dicyandiamde, a potentially toxic chemical, was found in some of its products. Chinese consumers are extremely sensitive to the quality of dairy products, especially after a series of scandals of domestic milk producers, including the one in 2008 when at least six children died and about 300,000 were poisoned after being exposed to milk powder tainted with melamine, a toxic chemical. Foreign-branded infant formula has become a premium commodity in China. To win back consumer trust, Chinese diary enterprises should learn lessons and implement top safety standards, said Chen Shangwu, a professor with College of Food Science & Nutritional Engineering of China Agricultural University. "Problems may pop up at every link through the production of dairy products. All related stakeholders from watchdogs to dairy enterprises should dedicate themselves to ensuring dairy product safety," Chen Shangwu said. New Zealand dairy giant Fonterra Monday apologized for the milk powder contamination scare in China. In the meantime, China's consumer quality watchdog issued another warning Monday morning over two potentially tainted New Zealand-made Karicare-brand infant formula products because of botulism concerns.